Available from Sunday 7 September, 2003 at 10:00am. 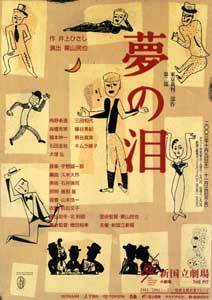 The play Yume no Sakeme (A Crack in the Dream), performed at the NNTT in May 2001, was created by starting with the concept of looking at the Tokyo Trial from a picture-card showman’s viewpoint and turning it into an epic play with music. In the series of performances of new plays at the Pit in the 2000/2001 season whose theme was “The Age and Memory,” the play was highly rated as a work that boldly tackled a serious subject from the viewpoint of the masses and was supported by many viewers. In particular, the rich musicality of the play, which transcended the framework of musical drama, produced a potentially expandable dramatic space by liberating the mind of characters in an elaborately crafted drama and also by eliminating explanatory stage settings. Yume no Sakeme is the first in the trilogy that Inoue Hisashi has long planned against the backdrop of the Tokyo Trial. The second play, Yume no Namida (Tears of the Dream), which will be presented this time, portrays Japanese people and society from Inoue’s unique viewpoint though it has a different story setting and different characters. Yume no Namida takes as its principle theme both the “crimes against humanity and peace,” for which Japanese military leaders were tried during the Tokyo Trial, and the Japanese people’s responsibility for the war, while the interesting and profound world that is so characteristic of Inoue unfolds. Crimes against humanity and peace are an issue that the entire world has been faced with since it was drastically changed by the September 11 terrorist attacks. Pursuing the significance of the Tokyo Trial in contemporary history, Yume no Namida is a serious yet comic play in the style of a musical drama that vividly depicts the difficult post-war lives of people who were obliged to be involved in the historical military tribunal. The forthcoming production will bring together Director Kuriyama Tamiya and a highly experienced production staff, as well as Kadono Takuzo, Mita Kazuyo and various other actors and actresses who have an established reputation for their solid acting. Audiences can look forward to this much publicized work, featuring live music, which is bound to fascinate and entertain without being too heavy. Officially known as the International Military Tribunal for the Far East, it convened in May 1946 with 11 justices representing the Allied Powers on the bench. The tribunal brought charges against political and military leaders of the Japanese government during the Pacific War, known as the so-called Class-A war criminals. In November 1948, verdicts were handed down upon the 25 defendants, including Tojo Hideki, the prime minister when the war was declared, and six other leaders who were sentenced to death by hanging.